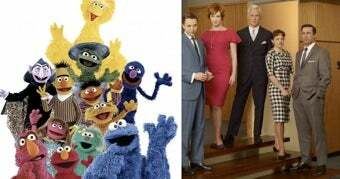 According to Joel Keller of TVSquad, Miranda Berry of Sesame Workshop has announced that Sesame Street will parody Mad Men (without the smoking and drinking, of course) during its upcoming season. Naturally, the Muppet world is rife with casting speculation. While the folks at Sesame Street will most likely create new characters specifically for the spoof, as they've so often done in the past, I thought it might be fun to cast a few old school Sesame characters in major Mad Men roles. Let's break it down, shall we? Prairie Dawn as Peggy Olson: Like Peggy, Prairie Dawn is a writer who, often enough, is the only female Muppet in a world filled with males. And nobody can argue that she's already got the hairdo down pat. Lefty the Salesman as Don Draper: Lefty the Salesman wasn't much of a salesman, but perhaps his attempts at selling shady merchandise to the folks of Sesame Street will help him prepare for the role of Don Draper. If nothing else, he looks good in a fedora. Clementine as Betty Draper: Clementine's boyfriend, Forgetful Jones, often neglects her due to his poor memory. Perhaps she could channel some of that frustration into playing the oft-neglected Betty Draper? Cookie Monster as Roger Sterling: Roger Sterling always wants to have his cake and eat it, too. Related: Cookie Monster will happily play any role that can even remotely be linked to the consumption of pastries. Bert and Ernie as Ken Cosgrove and Paul Kinsey: Though Bert and Ernie are best friends, they know what it's like to not always see eye to eye. Will they be able to pull off the tension and jealousy that arises at times between co-workers Kinsey and Cosgrove? Of course they will, people. Bert's uni-brow alone can bring the drama when necessary. Telly Monster as Freddy Rumsen: Telly, like Freddy, is always a mess and can never seem to keep it together. They're a sad-faced match made in Heaven. Lady Two as Joan Holloway: A former girlfriend of Count Von Count, Lady Two clearly knows how to vamp it up, and her sassy dress and bright red hair are perfect for the part. Elmo as Pete Campbell: Elmo is younger than most of his cast mates, but that doesn't stop him from trying to grab the spotlight at every opportunity. Oh, he may seem cute, but he can't be trusted. Elmo's already succeeded in getting his own show-within-a-show on Sesame Street. Surely he understands Pete's desire to get to the top. There are still a few major roles that need to be filled: feel free to add your suggestions in the comments!